Today I invite you to continue on this harmonic trip with a completely new topic. But it's not just any topic! In fact, it might just shatter some of your most deeply entrenched beliefs and fundamental certainties regarding harmony! Let me introduce you to modes and modal harmony! You are probably thinking now "But I already know about modes! There's the major and minor mode." Ah, but you are so naive: major and minor modes are only the tip of the iceberg! 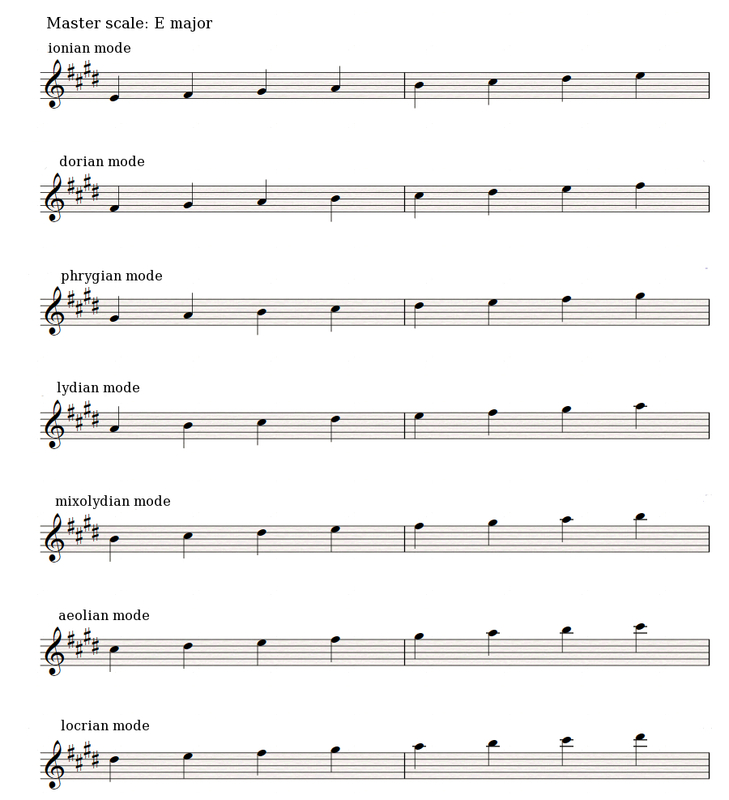 I'll let you in on a little secret: every scale has as many modes as it has notes! The example below will allow you to familiarize yourself with a new concept (in a later article we'll come back to the history and name of the modes..) by introducing the modes of the major scale. As you can see, each mode is based on a note of the scale and then unfolds respecting the other notes and intervals of the scale in question. That's why they are called "natural" modes, like the natural minor scale you already know and which corresponds to the aeolian mode above. The harmonic and melodic minor modes are not included because they are not... natural (duh!). The scale to which the modes are relative to I will refer to as the "master scale." The revelation of all these modes poses a big question, though. How to pinpoint the differences between a mode, a scale and a key? A scale is defined by the sequence of notes that make it up. 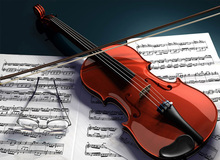 Hence, E major is made up of the E, F#, G#, A, B, C#, and D# notes. Yet, as you will see, these notes are all to be found in all the modes derived from the E major scale. From this follows that a song made up from the notes of a given scale doesn't necessarily mean that the song is in the key of that scale. And I'm not talking here about modulating to another key, but of a song which is exclusively composed of notes of one single scale. To cut it short: the fact that a song is written with the notes of the E major scale doesn't mean that the song in question is in E major! This, in turn, puts the notion of "key" in a different perspective! If it can't be defined solely by the notes that make it up, what is it then that characterizes a key? If you have been reading this series of articles (especially the installments dealing with modulation) you probably have an idea. The answer is that, besides the notes that make it up, the key is first and foremost characterized by the presence, frequency and progression of the key's degrees, most notably V and I! To put it simple, you could say that it's the presence of cadences – especially the perfect cadence – which defines the key of a song. Does this seem too arcane? Are you asking yourself what are modes good for, what do the modes from a minor scale look like and where do all these modes come from? Don't panic, you'll learn all of this in the upcoming articles!